The Seattle Seahawks will kick off their first home game of the season at CenturyLink Field Sunday, Sept. 27, hosting the Chicago Bears. This season will see the Seahawks continuing their well-established military support and traditions, with a few new additions from last season as well. That tradition will continue and those military members watching from the stands will even have a new section to sit in as well, that’ll show off their military pride. Servicemembers that attend a home game this season may notice a new camouflaged seating section. 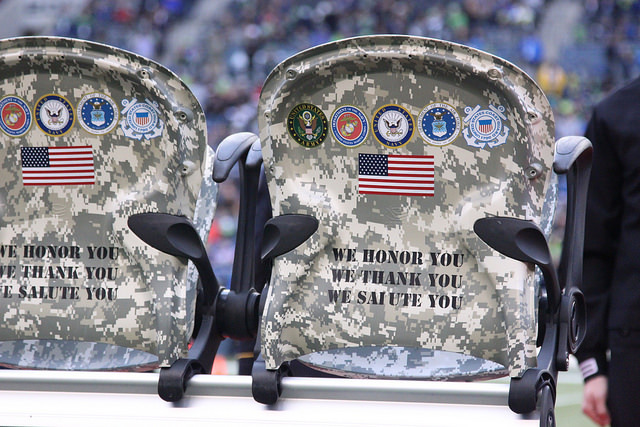 “During each home game of the 2015 season, six stadium seats have been camouflaged and designated to honor local military members at each home game,” added Lavender. This brand new seating section added to the stadium and designed to honor military members will be appropriately titled the Heroes of 12 Seat Program. All eyes will be on the Seahawks for their Salute to Service game this year Nov. 15 with a Sunday night primetime military salute game against one of their NFC West division rivals, the Arizona Cardinals. The U.S. Coast Guard 13th District will continue the change of command tradition by passing on the military ceremonial 12s flag to another military unit (to be announced) in the coming weeks. Servicemembers can stay up-to-date with all of the military involvement taking place this season by following along on social media, by using the social media hashtag #SeahawksSalute. Military members looking for even more opportunities to get involved and to take advantage of the ongoing military promotions throughout the year are encouraged to join the Military Sea Hawkers official military booster club for the Seattle Seahawks by visiting www.militaryseahawkers.org. As part of Military Appreciation Day, Major Scott Smiley, the U.S. Army’s first blind active-duty officer, raised the “12” Flag prior to kickoff. Major Smiley grew up in the Tri-Cities, and after his graduation from West Point, was seriously injured in a roadside car bomb six months after his deployment to Iraq. Since his recovery, Major Smiley received his Master of Business Administration from Duke University, taught leadership, and has commanded a Warrior Transition Unit at West Point and currently serves in Spokane as part of the Gonzaga ROTC. Although legally blind, Major Smiley has learned to surf, sky dive, and summited Mt. Rainier and Denali. He is the author of the book Hope Unseen. Many Seahawks suite owners hosted more than 100 servicemembers to watch the game as part of the Suites to Service Members program. September 9, 2014 the Seahawks and USAA held a ceremony to transfer the team’s honorary unit designation from the 446th Airlift Wing based at McChord Air Force Base to the U.S. Coast Guard 13th District. This is the third year of the program. The ceremony mirrors a deep-rooted military tradition, the change of command ceremony, where an outgoing commander formally transitions responsibility and authority of a unit to a new commander. 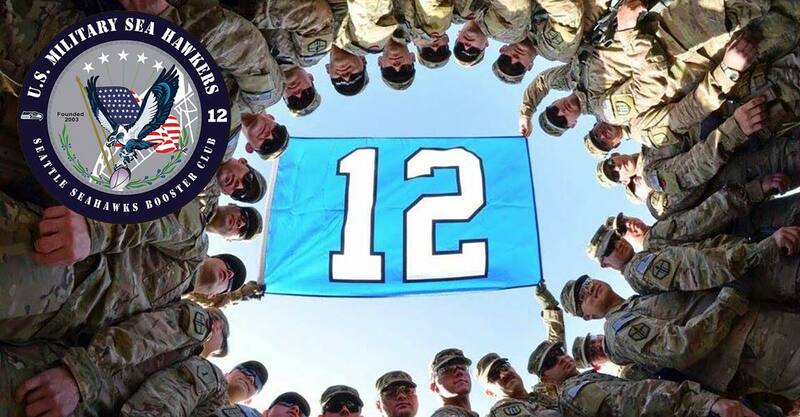 As the 2014 honorary unit, the U.S. Coast Guard 13th District received an official “12” flag to represent Seahawks fans across the world and support the team’s overall Salute to Service efforts.